For some time my stern - downstream mooring bridle has been buried, lost, gone, whatever ! I've just had a chain coming out of the mud which I have increased as needed to cope with 13m tides ! I've not been on it for a year now. To cut a long story short - when we went down the river a while back - to check on my mooring. It was not there ! Later - walking the south bank, we could see what was what - a large sheet of green tarpauling had wrapped itself around my stern riser, dragged the whole lot to nearly the river channel - stretching the guest line and upper bridle taught on the mud. We then made an epic trip up the axe at nearly low water - to reach this before it flooded. We cut away the guest line, attached a temp riser rope and old buoy, This floated the upstream bridle and buoy ok - if the downstream end was a bit iffy ! Luckily - the place it ended up was just about right for a new sinker. I made up six 50 kilo concrete sinkers - two with captive chains, four with central holes - that could be laced together in situ. Gerald had 65 m of leaded 16mm rope left over - that and new swivel, new A3 polyform buoy, 2m 10mm chain, a ground beam to dig into the bank ! 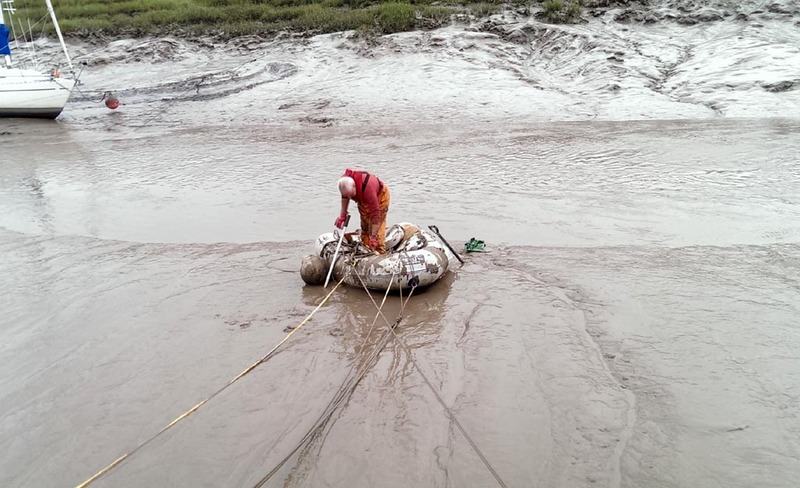 A week back we went down in the dingy and dug the bank slot - dropped in a 13m strop of the 16mm leaded - and left it dangling into HW on a fender. I then measured out from HW mark for a position for the bridles - so they could be made up in advance. Then take the boat down onto the mooring - attach the groundline at the bank - dry the boat out as close as possible to the sunk tackle. Then - before we lost all the water - load the sinkers into the dingy - and pull the dingy on the ebb so as to dry it out right by the old buoy ! So - Wed we went for it, The day was thankfully dry morning, but very windy later. Once on the mooring - no real problems. Getting the dingy to the spot was more difficult, needing three lines to control it against the considerable ebb flow. 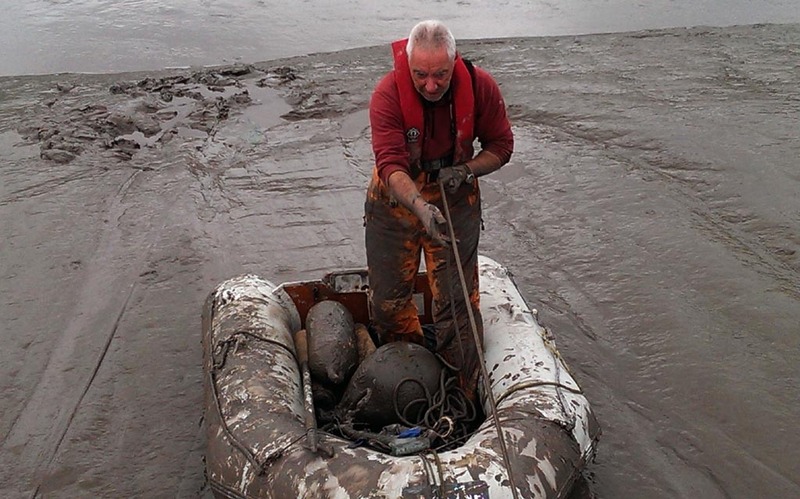 Once the boat was grounded - I took to the dingy loaded with the 380lbs of sinkers and me ! - and fair play to Wetline it coped fine. I then added an extra line from the bow - the 2:1 purchase to get back to the boat - then had the old riser line to pull on - and of course the new groundline to attach ! The flow there is fierce when the depth gets low on the ebb. With as good a hole as I could dig - the base sinkers drop in and get wobbled in. The next two go on top with the chain through them. Then the other stack alongside. Then the chains shackled together and a large shackle added for the groundline. I think really having done this a big angled metal plate would have been an option - but thse sinkers were easy to make up and cheap. I had sorted all this out to be able to do it on my todd - but having a helping hand made life a lot easier - and took the pics ! The six chained together at the last minute were manageable. They have been in the garden, the front yard, the car, the Uphill boatyard compound, Lena's cockpit for five days - glad to see them finally off my back ! All done and the 2:1 works a treat getting back to Lena - but the last three feet was a bit of a farce. We refloated at about 1830, wind picked up some - and made it back to the Uphill pontoons by dusk. 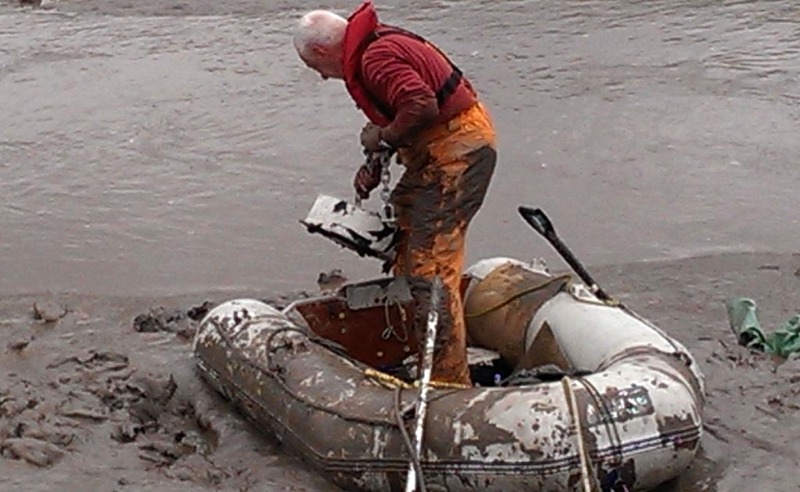 Left it all tied to the boat and spent all next morning with the hose on the slipway.